We are excited to now offer Spinal Decompression for treating lower back pain, neck pain, sciatica, pinched nerves, hernatied or bulging discs, and degenerative disc disease. 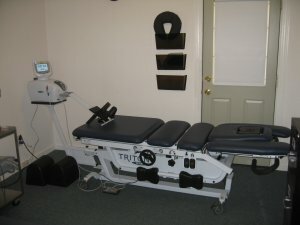 Our new Triton DTS Spinal Decompression table will gently pull your spine, creating decompression (the unloading due to distraction and proper positioning) to improve blood flow and important nutrient exchange to the injured area. 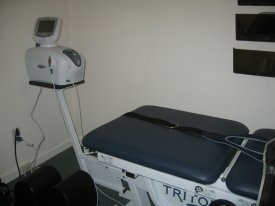 Your comfort and safety are the primary focus while on our Triton DTS® Traction table. When you are comfortable you can achieve the ultimate objective of spinal decompression and rehabilitate your discs and spine. 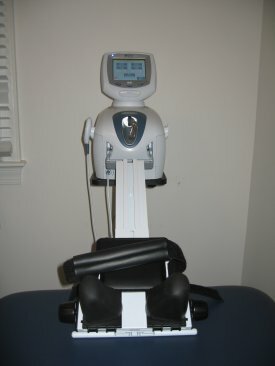 During the decompression stage of the traction system you will feel several cycles of stretching and relaxation. Sessions typically last for approximately 20 minutes depending on your unique condition and the desired outcome. Some patients feel relief from pain with as few as 5 - 8 treatments while a full protocol is generally 18 - 20 sessions over a 4 - 6 week period. Lumbar Decompression for sciatica, bulging or herniated discs in the lumbar spine, degenerative disc disease, and lower back pain that may cause pain or numbness in your leg or foot. Cervical Decompression for compressed discs such as bulging or herniated discs, degenerative disc disease of the cervical vertebrae, pinched nerves with radiating pain or numbness in the arms. Lower back pain affects at least 80% of us some time in our lives, approximately 20-30% of us at any given time. Back pain can occur at any age however it is more prevalent between 30 years old to 60 years old. We are happy to offer a non-surgical alternative to medications, injections or learning to live with the pain. According to the American Spinal Decompression Association, Spinal Decompression is a spinal disc rehabilitation program that gently stretches the spine and decompresses the disc. The unloading due distraction and positioning, has shown to gently separate the vertebrae from each other, creating a vacuum effect inside the discs that we are targeting. This vacuum effect is also known as negative intradiscal pressure. The negative pressure can induce the retraction of herniated or bulging discs into the inside of the disc space, and off the nerve root, thecal sac, or both. It only happens microscopically each time but cumulatively, generally over four to six weeks, the results can be dramatic. The cycles of decompression and partial relaxation over a series of visits promotes the diffusion of water, oxygen, and nutrient-rich fluids from outside the disc to the inside which help promote the disc to heal. We hope that while you are considering your spinal health and life free of pain that you consider calling us to discuss this non-surgical pain relieving system. Dr. Adamson is also happy to discuss our decompression therapy during a free consultation.